The many powerful accounts of the Holocaust have given rise to women’s voices, and yet few researchers have analyzed these perspectives to learn what the horrifying events meant for women in particular and how they related to them. In Experience and Expression, the authors take on this challenge, providing the first book-length gendered analysis of women and the Holocaust, a topic that is emerging as a new field of inquiry in its own right. Accessible to readers on many levels, the essays portray the experiences of women of various religious and ethnic backgrounds, and draw from the fields of English, religion, nursing, history, law, comparative literature, philosophy, French, and German. The collection explores an array of fascinating topics: rescue and resistance, the treatment of Roma and Sinti women, the fate of female forced laborers, Holocaust politics, nurses at so-called euthanasia centers, women’s experiences of food and hunger in the camps, the uses and abuses of Anne Frank, and the representations of the Holocaust in art, film, and literature in the postwar era. 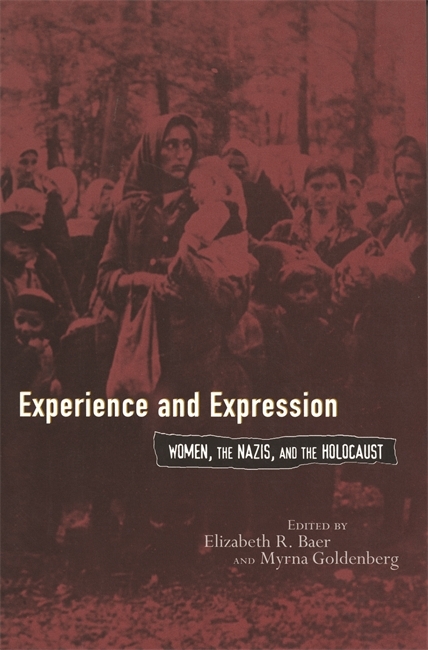 The introduction provides a thorough overview of the current status of research in the field, and each essay seeks to push the theoretical boundaries that shape our understanding of women’s experience and agency during the Holocaust and of the ways in which they have expressed their memories. Elizabeth Baer is the Raymond and Florence Sponberg Chair of Ethics and a professor of English at Gustavus Adolphus College. Myrna Goldenberg is a professor of English and the director of the NEH-funded Paul Peck Humanities Institute at Montgomery College. Experience and Expression is superbly edited and introduced by Elizabeth R. Baer and Myrna Goldenberg, two outstanding scholars and editors. They have achieved the difficult feat of assembling in one collection essays of a very high caliber, each of which is clear, focused, and accessible, and many of which contain new insights and ideas. This is a significant and compelling work that will prove indispensable to everyone who wants to study about Women, the Nazis, and the Holocaust. Experience & Expression compels us to re-examine familiar thoughts and ideas during the years from l933–l945. Baer and Goldenberg made a most important contribution for future scholars and provide a rare blend of views on the subject of women and their roles during the Holocaust. This book is an important addition to an already enormous collection of literature on the Holocaust, and to a smaller but nonetheless impressive array of books and articles on women's experiences. Elizabeth Baer and Myrna Goldenberg have gathered a diverse and interesting set of articles that focus on women's experiences in the Holocaust. Although numerous books on the subject by recognized and respected scholars have come out since [the early 1980's], the editors of and contributors to Experience and Expression: Women, the Nazis, and the Holocaust still find it necessary to defend their consideration of women and gender. Taken as a whole, what distinguishes this anthology from earlier works on the subject is its interdisciplinary depth (contributors range from academics specializing in literary studies, Holocaust studies, philosophy, and religion, to nursing professionals and independent scholars) and the spectrum of women's experience that it addresses. It builds on existing scholarship, expanding the field of inquiry in new directions and pointing to areas where further research is needed and untapped archives should be explored: comparative gender analyses of socialization and Holocaust experience; sociological studies of Roma and Sinti life prior to the Holocaust; and nationality-based studies of Holocaust experience. In the broader context of genocide studies, the brief reference to the relatively new area of scholarship on gender and genocide in the introduction points to a productive link to future comparative analyses of genocide across the globe." Experience and Expression: Women, the Nazis, and the Holocaust is an important collection of essays on the Holocaust. Built on the foundation of previous work on women and the Holocaust, it represents a new generation of writers, those who seek understanding of the Holocaust. The essays are written from diverse perspectives and disciplines but with a singular respect for the magnitude of the Holocaust and the importance of understanding the role of women, both as victims and as perpetrators. Elizabeth R. Baer and Myrna Goldenberg have chosen wisely and enhanced our understanding where women's experiences during the Shoah parallel those of men and where they differed. It should silence those critics who believe that an emphasis on women is misplaced and disruptive of our understanding of the Final Solution of the Jewish Question. To approach the Shoah, we must use all the tools at our disposal; Experience and Expression does that.